Size :: 6.25" x 4.5" x 1.75"
The LunchBots Duo is the ideal container for snacks. It has a handy divider for crackers and cheese, fruit and nuts, and more. 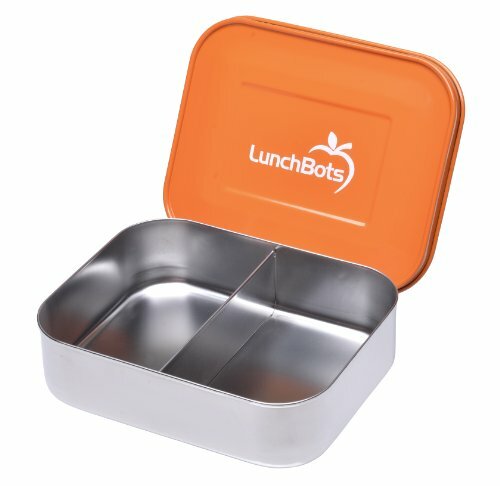 LunchBots are stainless steel lunch and snack containers that are healthier than plastic and better for the environment. Both the container and the lid are made from the highest quality, 18/8 stainless steel. LunchBots are safe, eco-friendly, and durable. Ideal for sides and snacks, LunchBots Duo Stainless Steel Food Containers have a handy divider for your favorite combinations: apple wedges and cheese, a half sandwich and carrot sticks, blueberries and almonds, mini pitas and deli-sliced turkey, and on and on. Whatever you pack, even picky eaters will find lunch more appetizing. Made of the highest quality 18/8 stainless steel, LunchBots Duo food containers are free of plastic and BPA. To keep your Duo looking great, handwash the orange lid and place the base in the dishwasher.